Students will write a final paper (15-20 pages) pursuing a research question that has been developed in stages - the so-called "fits & starts" - throughout the course of the semester. For weeks 2 through 6 of the semester, you will submit 1-2 page response papers to that week's readings, lectures, and discussion. Rather than writing before class, you will have 2 days (48 hours) following each Thursday class (thus, Saturday at 2pm) to submit your responses electronically to the wiki, with the specific intention of drawing out research questions that you might want to pursue for your final paper. These can change from week to week, but the intention is to get you thinking in- depth about your final projects early on; grappling with the issues will also help students absorb and benefit from both the readings and the lectures. An example of a proposal will be provided so that students have a clear idea of the elements and structure of what you are expected to provide. The goal of the proposal is to get you to the next level of thinking about your final project in terms of feasibility and structure, as well as an exercise in learning how to write a good proposal as a practical skill. 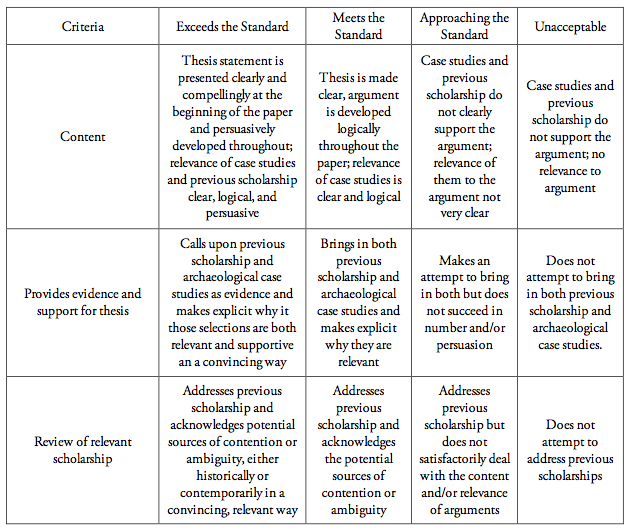 The paper should call on both theoretical scholarship and archaeological case studies. After the development and approval of the proposal, you will provide an annotated bibliography of at least five sources; these do not have to have been read in their entirety, but you should explain what you foresee as the relevance to the issues you are pursuing in your final project. Examples of good and bad annotated sources will be distributed as a model. This will build upon the proposal in promoting your understanding of the scope, structure and feasibility of your project. Additionally, it will be an exercise in learning how to research for sources and grasp the usefulness of sources both before and after you may have read them. A full draft (15-20 pages) of the paper will be submitted by week 12. These will be circulated to groups of 2-3 students for peer review the week after Thanksgiving break. Peers will comment on these papers according to a rubric (see below) distributed at the beginning of the semester, and both the paper and the review comments will be graded on their thoughtfulness and adherence to the rubric. The second draft will be evaluated on how thoughtfully you take into consideration the comments of both your peers and the instructor.